Rare and wonderful, 1860's Ninth Plate Ambrotype Photograph of a young, Civil War Union Soldier wearing an oilcloth covered kepi. This original, Ambrotype Photo measures approx. 2" by 2 1/2" (Ninth Plate size). The Soldier is not identified in any way and the Ambrotype is cased in a beautiful Gutta Percha / Thermoplastic, geometric hard case that is in excellent condition (Image appears to be original to the case). This fantastic 1860's Ambrotype features a bust portrait of a young, unidentified Union Army Soldier wearing what appears to be a frock coat and kepi. The kepi is covered with a waterproof oilcloth. 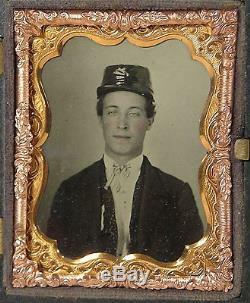 This simply wonderful, 1860's, Ambrotype Civil War Soldier Photo is in excellent condition. The Image is crisp and bold with sharp focus, strong contrast and warm, rich tonality. The surface retains its original, brilliant surface shine and there is no crazing, no flaking, no scratches, no surface loss or damage of any kind. The case is also exceptionally well preserved with no chips, cracks or damage of any kind other than a tiny flea bite to one of the eight corners (the other 7 corners are sharp) and a second tiny flea bite at the center of the top edge. The closure is present but does not engage to lock the case shut. Overall this is a very attractive and well preserved Image and case that displays beautifully. Please see the scans below. A very rare and very attractive, 1860's Ninth Plate, Plate Ambrotype Photograph of a young and handsome Civil War Union Army Soldier housed in a Gutta Percha / Thermoplastic hard Union Case and a fantastic addition to any collection!! And Click Here to Add Us To Your Favorite Sellers List. Click Here to Discover More About this Item and Many Others on Our New Informational / Non-Commercial / Reference Blog - Walnutts. The item "1860's CIVIL WAR AMBROTYPE PHOTOGRAPH OF UNION SOLDIER IN GUTTA PERCHA CASE" is in sale since Friday, June 26, 2015. This item is in the category "Collectibles\Militaria\Civil War (1861-65)\Original Period Items\Photographs".